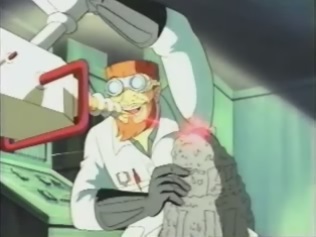 Dr. Karl Von Fragman has discovered something. 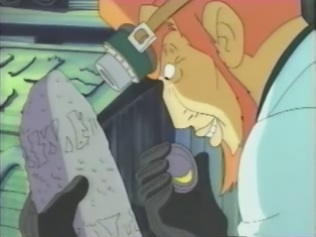 He has found a rock, and he uses a laser to cut into it. 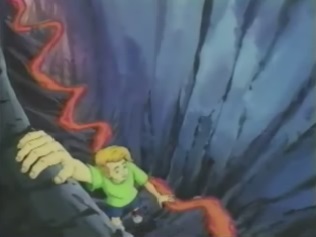 The rock breaks open revealing what he calls a "slammer of darkness". 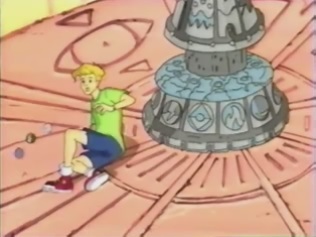 According to the hieroglyphics on the rock, the slammer is controlled similar to how a spinning planet is controlled by the sun. 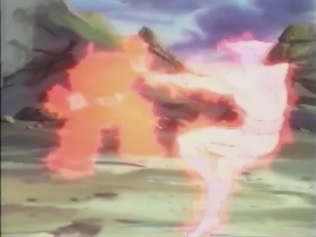 Von Fragman spins the slammer around him, and it then starts to glow. 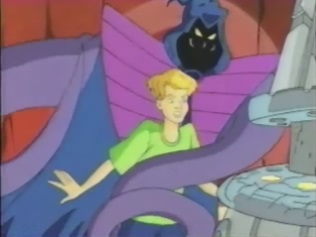 Seconds later out pops a being called Shadow Slammer, who kneels down and says that the doctor is his new master! 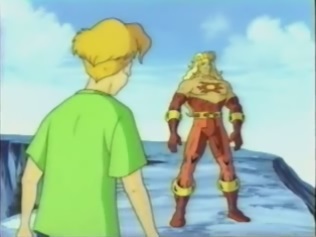 Von Fragman realizes that the legend is true and asks Shadow what kind of powers does he possess. 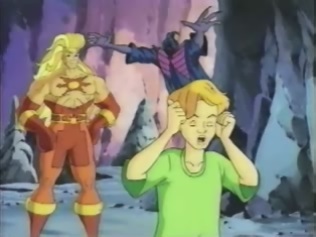 Shadow says he can bring darkness to the heart and terror to whoever he touches. Von Fragman asks if there are others like him and he says that there are -in total there are 5 slammers of darkness, and 5 of light. 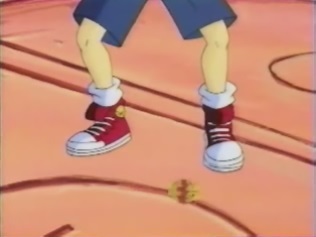 Whoever has them all will have the power of the world. 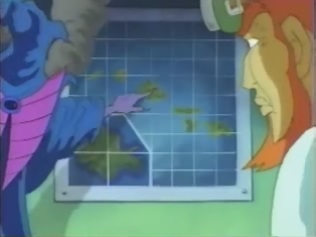 Von Fragman asks where the others are and Shadow points out an island on a map: a volcano. 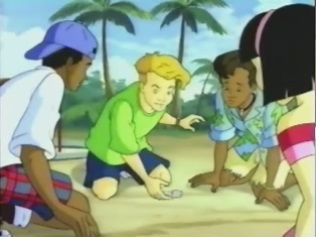 And on that island, a kid called Ronnie is playing pogs slammers trading cap phenomenon. He's pretty good at it and says that whoever has the least caps after this game has to buy pizzas for everyone. 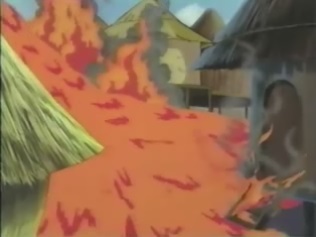 Meanwhile, Von Fragman is already on the island, and has gone into the volcano with Shadow. 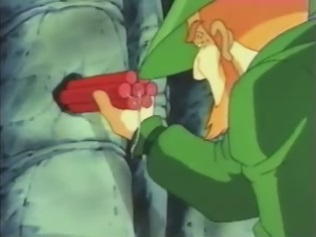 Shadow points out that where they need to be is beyond a wall, so Von Fragman drills a hole and then sets some dynamite. 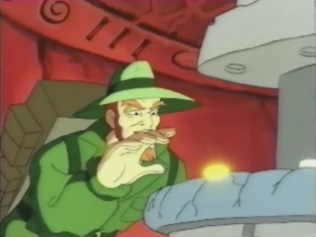 The dynamite explodes, and in the next part of the cave, Von Fragman sees what he is searching for: another slammer! 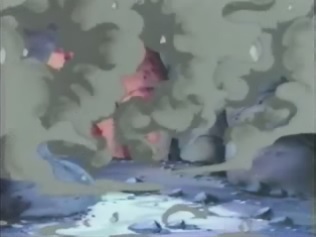 But the explosion has caused a small eruption, and before Von Fragman can grab the slammer, he is forced to run away from some lava. 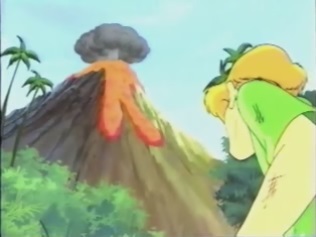 Von Fragman retreats to a safe distance and says that was just a small setback and the eruption should settle soon. 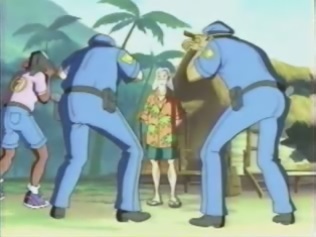 But Shadow tells him the Hawaiian Slammer was blown out of the volcano, and points to where it is now. 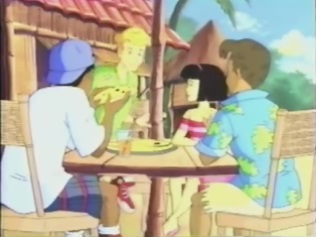 Elsewhere, Ronnie and his friends are having pizza when Ronnie says he has to go. 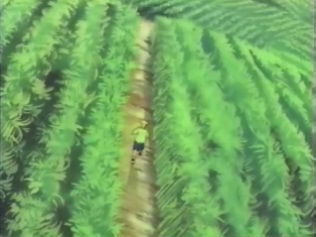 He realizes that he is going to be late for his guitar lesson, so he takes a shortcut through a field. 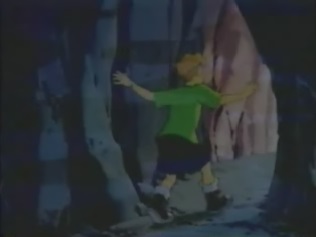 As he goes through the field he trips over a rock. 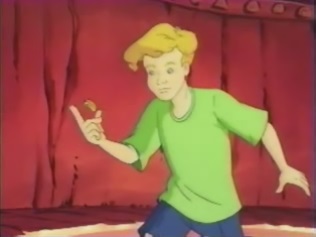 When he looks at the rock he sees a slammer in it, and after using a small knife to get it out, he sees that this slammer is made of metal, not plastic. 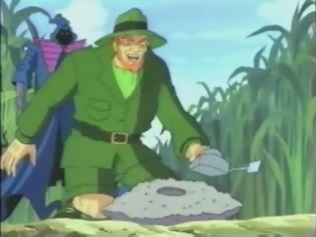 He goes on and leaves the rock behind, and a few moments later, Von Fragman finds the rock. 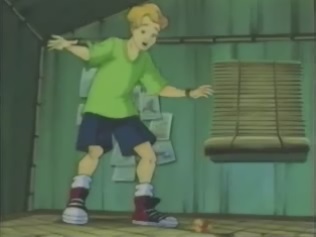 He now has some kind of device that lets him track the slammers, but he sees that the slammer is gone. But the device shows that it hasn't gone very far. ...and it starts to glow. 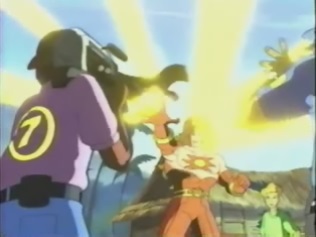 A second later, another being appears: Sun Slammer! 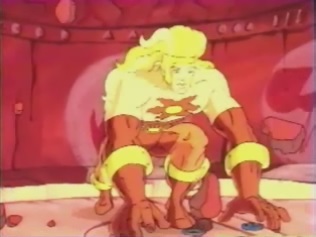 Sun kneels before Ronnie and makes the same speech that Shadow did to Von Fragman earlier. Ronnie doesn't quite know what to make of him. 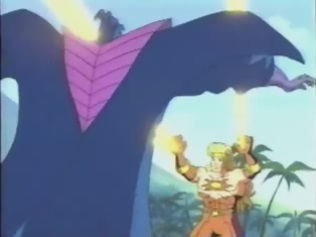 Von Fragman orders Shadow to destroy Sun, so he goes off into combat. 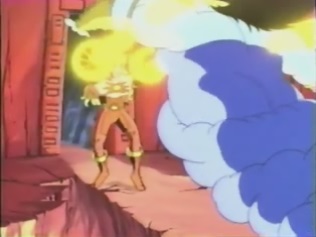 He throws Sun through a wall and goes outside, but Ronnie tells Sun to fight back. 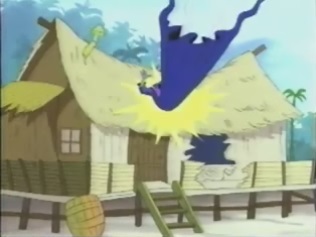 Sun uses some beam blasts to knock Shadow back, and he is sent flying into the house. 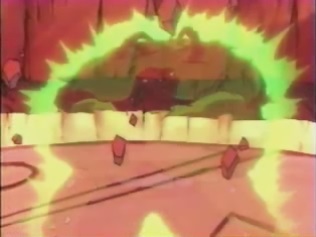 So great was this explosion that it caused a warp in space and time. 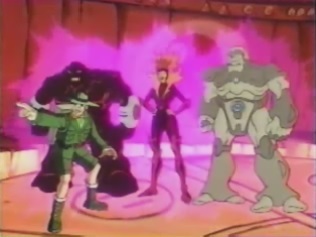 Through this warp came 5 evil entities from another world, known as the slammers of darkness: Lava, Storm, Lead, Fire and Shadow. These slammers of darkness decided to run riot on the Earth, attacking people and destroying their villages. 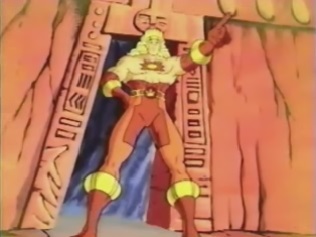 In an attempt to stop them, 5 slammers of light were sent through the warp: Rain, Earth, Gold, Ice and Sun. 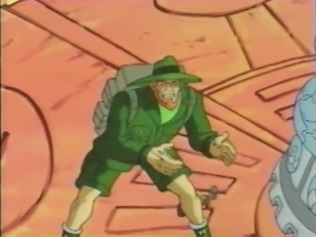 The slammers battled each other continuously, with battles spanning over a 100 years. 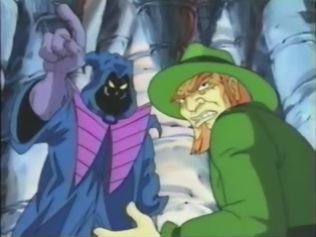 However, slammers are immortal, meaning there was no way for them to destroy the dark ones. The only choice they had was to hold them, and to trap themselves at the same time. To achieve this, the slammers of light locked the energies of their enemies and themselves into the small, metallic disks. It was their ultimate sacrifice. 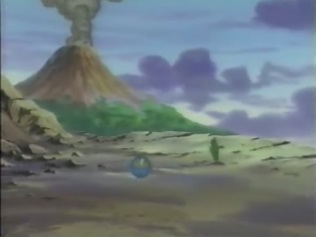 Sun and Shadow battled for the final time in the volcano, where the other discs had been stored, before Sun turned himself and Shadow into discs. 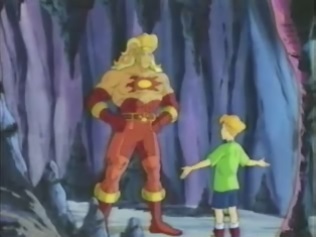 Back in the present, Sun says he doesn't know how they managed to become free today. Ronnie asks how he came to him. 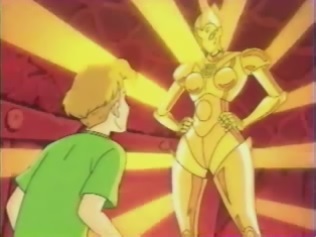 Sun says that slammers can only be controlled by those who have energies of a similar nature. 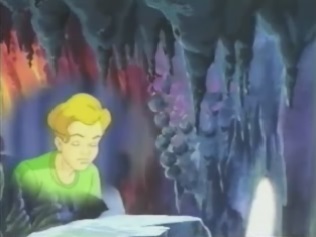 Evil people can control the dark slammers, whilst good ones, such as himself, can control the ones of light. 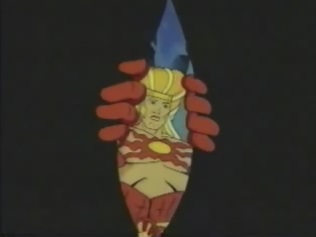 If Von Fragman gets them all, he will control the Earth. 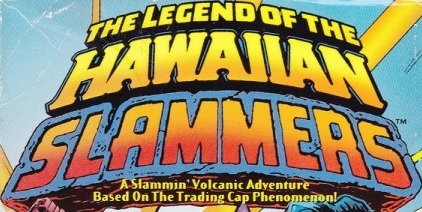 Sun says that the other slammers are in the volcano. The two get up there but Ronnie wants to back out, saying he's just a kid and this is the kind of thing the army should handle. 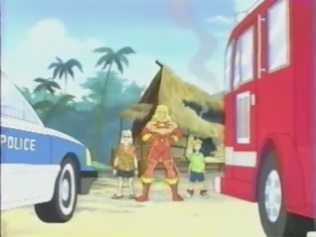 Sun says the armed forces cannot stop the slammers, only he can. He's got to make the same choice he made 3,000 years a go: to act for himself, or to act for the good of all. 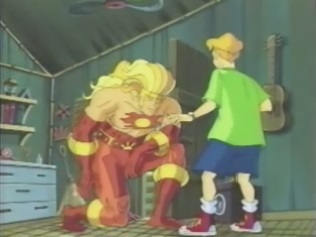 He says he will help him with all of his power. 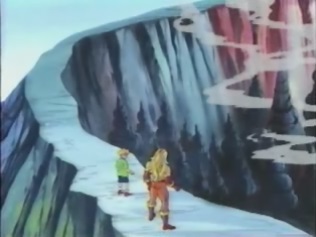 Ronnie says if Indiana Jones can do it, so he can, and the two start to descend into the volcano. 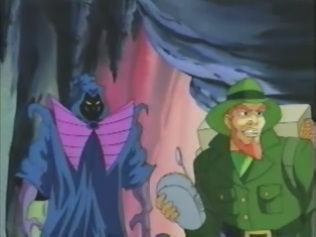 What they don't know is that Von Fragman and Shadow have seen them. 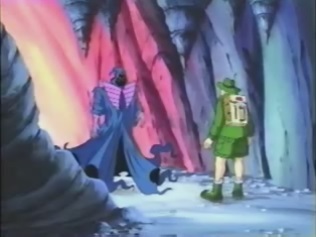 Shadow says they will never return to the surface again. 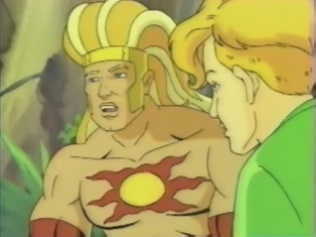 Ronnie asks how he is meant to find the slammers, and Sun tells him to use his inner senses. 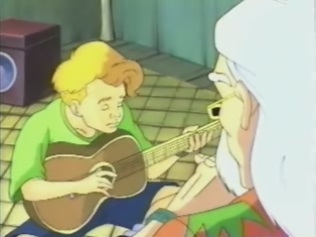 Ronnie says he can't do it but Sun tells him he can, as he's done it before, when he found him. 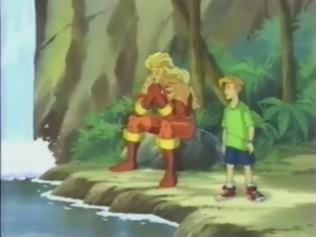 Ronnie thinks all he did was fall over a rock, but Sun says he was drawn to him. He doesn't need to think about it, he just needs to do it. Ronnie concentrates hard and sure enough, he figures out the correct route to the other slammers. Von Fragman sees them walk off and says that whilst he doesn't know how they're doing it, the two are going the right way. 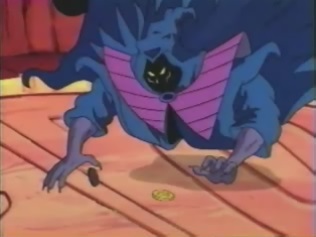 He doesn't want the boy seeing the other slammers before he does, so Shadow makes a move. Ronnie comes up to a path with two different routes, so he concentrates to work out the right one to take. 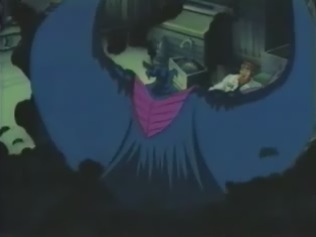 But as he does this, Shadow appears and traps him in a dark void. 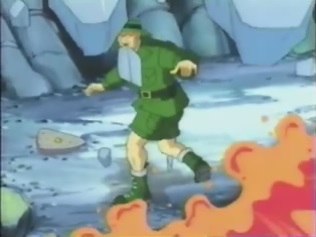 Ronnie stumbles around looking for Sun, but then takes a wrong turn and ends up plummeting down the volcano! 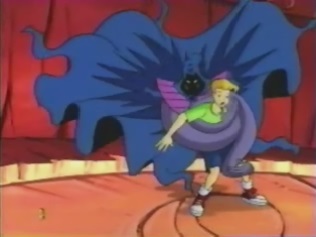 Sun rips apart the dark cloak and starts looking for Ronnie. 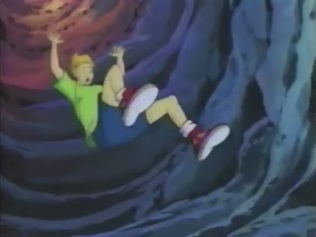 After sliding down a few tunnels, Ronnie is almost sent flying into a lava stream, but he manages to grab onto a ledge and pull himself back up. 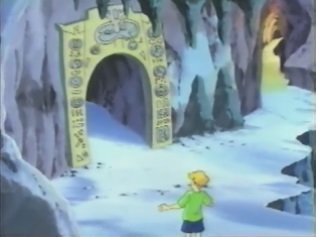 As he takes a look around, he sees that he is where he needs to be: an entrance with the various slammer symbols on it. 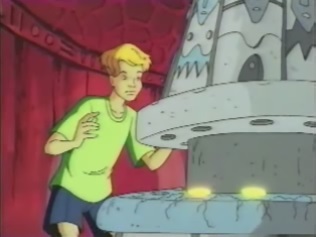 He goes through the entrance and comes across a chamber with some kind of stone in the middle of it. 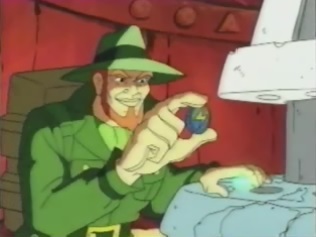 As he takes a better look at it, he sees that the other slammers are there! 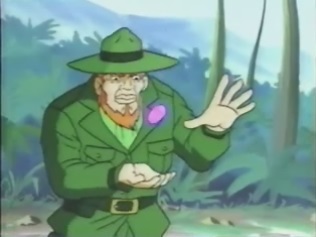 But before he can grab any of them Von Fragman appears. He has Shadow restrain Ronnie, whilst he takes a couple of the slammers. 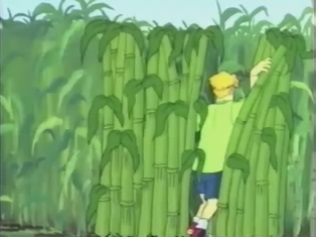 After searching for over 20 years, he's finally found them. 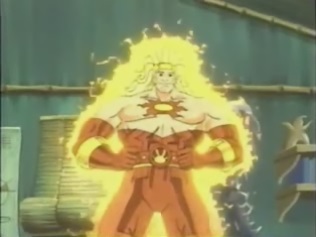 Sun then appears and says that after protecting them for over 3,000 years, he's not about to let them fall into Von Fragman's dirty hands. 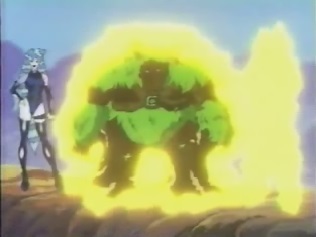 Von Fragman says he's too late and spins on of the slammers around himself, revealing one of the dark ones: Storm. Storm starts to fight with Sun. 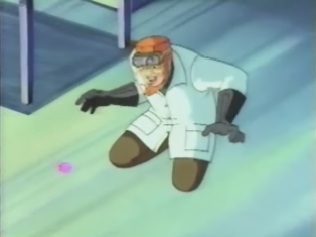 Von Fragman picks up another slammer, but Ronnie manages to get out one of his own plastic slammers. 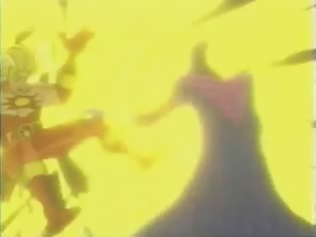 He flicks it at Von Fragman, knocking the metal slammer out of his hand. 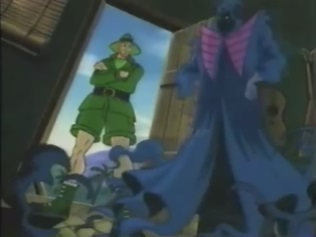 Von Fragman tells Shadow to reclaim it, so he lets go of Ronnie and heads towards the slammer. 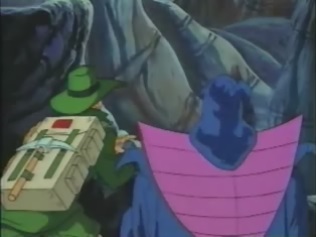 As Shadow does this, Ronnie pulls out another plastic slammer, and throws it at the metal one Shadow is after. 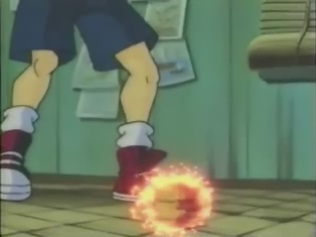 It hits and the metal slammer is sent spinning back to, and then around, Ronnie. Seconds later Gold appears, who tells Ronnie to stop gawking and command her. 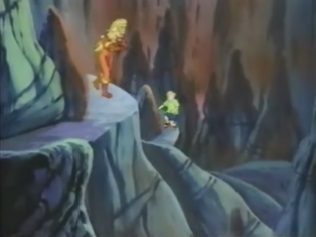 He tells her to go and stop Von Fragman, but before she can do that, the doctor has already grabbed another 3 slammers. 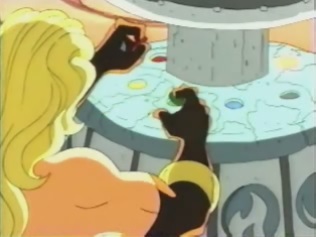 He spins them around himself, which reveals the final 3 slammers of darkness: Lava, Fire and Lead. 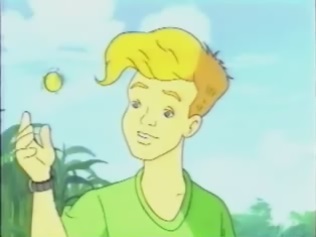 He tells them to stop Gold. 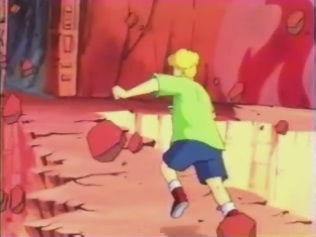 Ronnie tries to stop Von Fragman himself, but ends up getting thrown into the stone for his troubles. 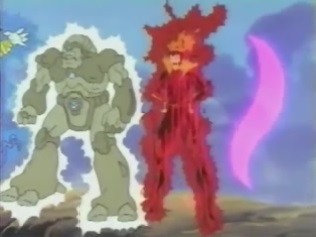 This knocks out the final 3 slammers of light, which spin around Ronnie and reveal the final 3 beings: Rain, Earth and Ice. 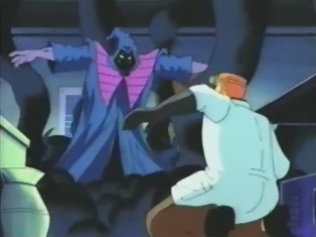 With all of the slammers back, they all start to fight each other. 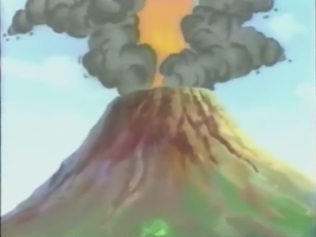 As they release projectile attacks everywhere, the volcano starts to shake: it is going to erupt! 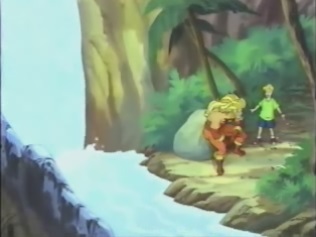 Von Fragman runs away, whilst Ronnie tells Sun that they need to get out of here, but he says no. He and the others will trap the dark slammers here again, whilst Ronnie must get out whilst he can. Ronnie starts to run, whilst the slammers continue to fight. 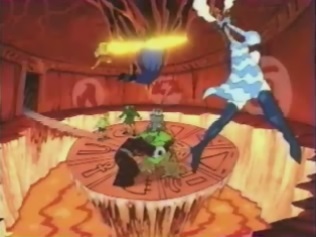 The slammers of light start to trap their opponents and themselves back into slammers. Sun sees off Shadow and then collects all of the other slammers. 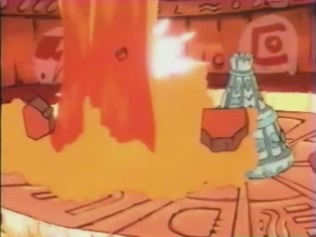 He puts them back into the stone statue just as the lava pours into the chamber, and all over him. Has he survived? 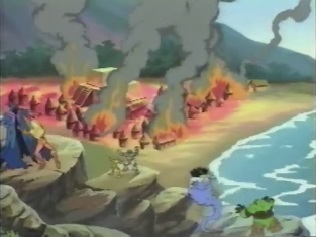 Ronnie has made it out and sees the erupting volcano, but there are no sign of the slammers anywhere. 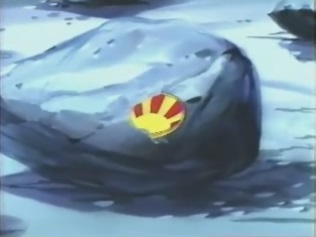 He says goodbye to Sun Slammer and starts to walk away, but trips over a rock again. 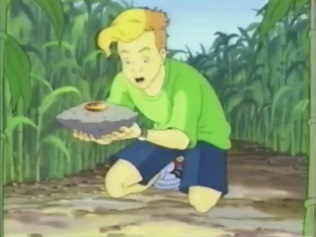 As he looks at the rock, he sees that it has the Sun Slammer cap inside it! 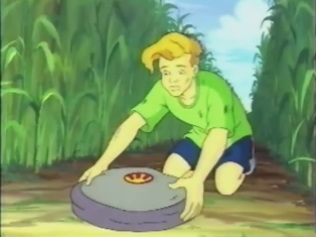 He picks up the rock and runs back home.